Louisville native, James F. McDonald, received his Bachelor of Science and Master of Science degrees in electrical engineering from the University of Kentucky in 1962 and 1964, respectively. Following graduation, he joined the International Business Machines Corporation as an associate engineer in the Office Products Division. He held a variety of positions during his 21-year tenure with IBM and at the time of his departure in 1984, he was general manager of the Manufacturing Systems Products Business Unit where he had responsibility for a wide range of products including industrial terminals and computers, automated assembly lines, factory local area network products, industrial robots and manufacturing controllers. 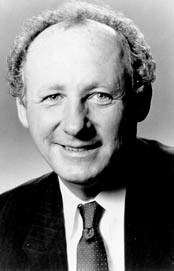 From 1984-89, Mr. McDonald held senior management positions at Gould, Inc., a $1.4 billion electronic company, first as president and chief executive officer, and as of 1986, as chairman and chief executive officer. At Gould, Mr. McDonald supervised the restructuring of the company’s operations following an unsuccessful attempt to diversify the $2.3 billion industrial company into high-tech electronics. The restructuring successfully culminated with the sale of Gould to Nippon Mining in 1988. After agreeing with J.H. Whitney to serve as president and chief executive officer for two years, Mr. McDonald led the successful restructuring of Prime Computer, Inc., a $1.6 billion supplier of CAD/CAM software and computer systems. He served as vice-chairman of Prime Computer until joining J.H. Whitney & Co. in July of 1991. He joined the New York-based venture capital firm as a general partner specializing in high technology companies. The Whitney organization has approximately 50 to 60 companies in varying stages of development in its investment portfolio. In July 1993, Mr. McDonald became president and chief executive officer of Scientific-Atlanta, Inc., a world leader in broadband communications systems, cable television electronics, satellite-based communications networks and instrumentation for industrial, telecommunications and government applications. Mr. McDonald is director of a number of companies and service organizations including Scientific-Atlanta and Burlington Resources, Houston, a diversified resources and energy company. He is a member of the Technical Advisory Committee of the Engineering School at Northwestern University; Development Council of the University of Kentucky; the University of Kentucky’s Business School Advisory Council and College of Engineering Dean’s Council; Emory University Business School’s Dean’s Advisory Council; Trustee of the Woodrull Arts Center in Atlanta; and, Board of Advisors of the Atlanta Chamber of Commerce. In addition to golfing, hunting and jogging, Mr. McDonald takes every opportunity he can to unwind at his Texas cattle ranch. He and his wife, Paula, are the parents of three daughters, Ashley, Susan, and Jimmie Lynn.